This grape is extensively grown in Spain's Bierzo and Ribeira Sacra regions. Plantings have increased over the past 30 years as popularity and interest from winemakers has increased. It was rumored to be an ancient clone of Cabernet Franc but DNA testing has since dispelled any evidence of that. Wines made from Mencía are often light, pale, and somewhat fragrant and made for early consumption. Hillside plantings and careful vineyard practices have led to wines of better structure and aging potential. 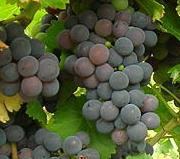 Mencia ripens early, by mid-September, and is well suited to the maritime climate of Bierzo where autumn rains are normal. Bierzo produces wines from Mencia with uncommon complexity and depth. The region received its DO (Denominación Origen, or official recognition from the Spanish wine authorities) in 1989. Bierzo is cultivated by about 4,200 growers, making the average holding just over two acres. With such fragmentation, cooperatives have not surprisingly played an enormous role in the area, and were largely responsible for the preservation of the old vineyards. Without the co-ops, it wouldn't have been economically feasible for many farmers to make wine, and their old vines and vineyards would have been abandoned.